Southeast Asian consumers continue to be among the world’s most avid savers, with more than two thirds (68 per cent) putting aside their spare cash. When it comes to savings, consumers in Vietnam keep the highest sum globally (76 per cent), followed by Indonesia (70 per cent), the Philippines (65 per cent), Malaysia & Singapore (63 per cent), and Thailand (62 per cent). 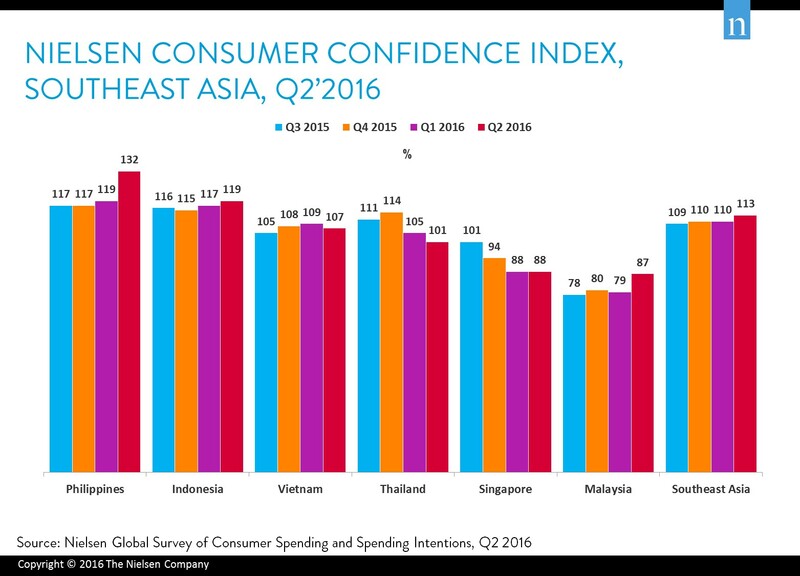 Despite a slight decrease of 2 percentage points in the second quarter of 2016, Vietnamese consumer confidence continues staying at a high level, ranking as the 7th most optimistic country in the world, according to the latest Consumer Confidence Index released by global information and measurement company Nielsen. The report also reveals that consumers in Southeast Asia are still among the most confident across the globe, reaching 113 points (up 3 percentage points compared to the last quarter). Philippines hit a new record in this quarter, posting a score of 132 points (an up of 13 percentage points, the biggest quarterly increase) that helps the country surpass India to become the most optimistic country worldwide. Indonesian remains in the third place with 119 points (+2pp). Consumer confidence in Thailand edged down 4 points to 101, while Malaysia jumped 6 points to 87. Singapore maintained the 88 points from the previous quarter. (See chart 1). “At the height of the internet of things, the market sentiment immediately and clearly reflects the Good, the Bad, and the Neutral. 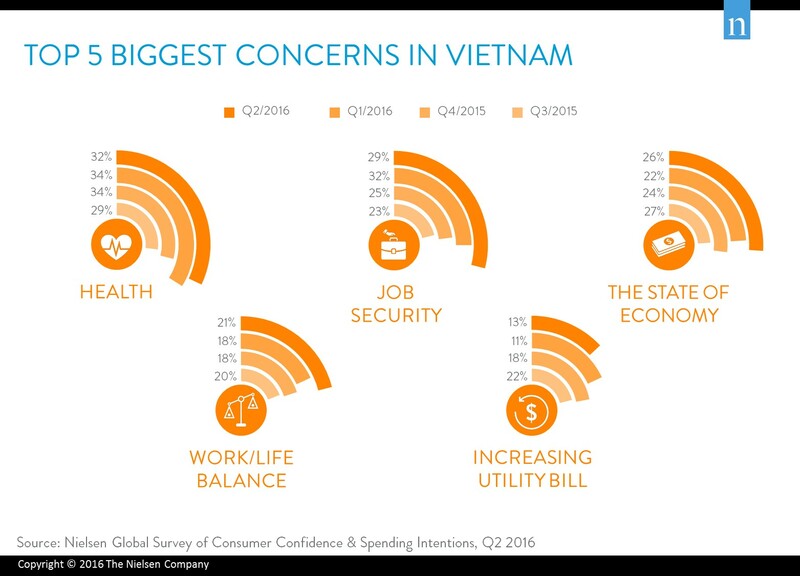 Vietnamese consumers pay close attention to what is happening, easily influenced by word of mouth, social media, and other news sources, and quickly react to changes. This requires even faster actions from manufacturers and retailers to foresee and address these concerns before they settle in consumption decisions. However, it is a fact that Vietnamese people continue to be optimistic about the local economy, markedly more so than in other nations, encouraged by the continued growth of the middle class and a stable governmental economic outlook,” said Nguyen Huong Quynh, managing director of Nielsen Vietnam. 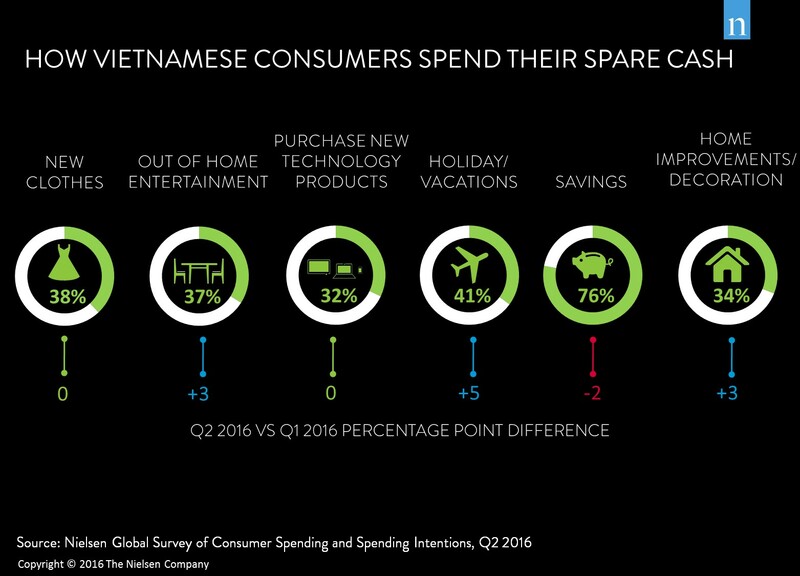 Along with channelling spare cash into savings, consumers in Vietnam are also eager to spend on big ticket items. The survey also revealed that, after covering essential living expenses, around two in five Vietnamese consumers are willing to spend on big ticket items, such as holidays and vacations (41 per cent, with a 5 per cent increase since the last quarter), new clothes (38 per cent), and out-of-home entertainment (37 per cent). Health remains a key concern for Vietnamese consumers, with nearly one third (32 per cent) citing it either as their first or second priority over the next six months. Job security and economic uncertainty remain second and third as concerns go (29 and 26 per cent, respectively). Political stability (8 per cent) and crime (8 per cent) emerge among the other major worries in the country. Additional items on the list include work/life balance (21 per cent), increasing utility bills (13 per cent), and food prices (12 per cent), as well as parents’ welfare and happiness (8 per cent). “Consumers are looking to lead healthier lives. As a result, it comes as no surprise that health continues to be a top concern. Besides, while consumers continue to be upbeat about their future, financial security remains another top priority. Both job security and economic outlook have a direct impact on consumers’ degree of financial security and hence remain key concerns,” emphasised Quynh.